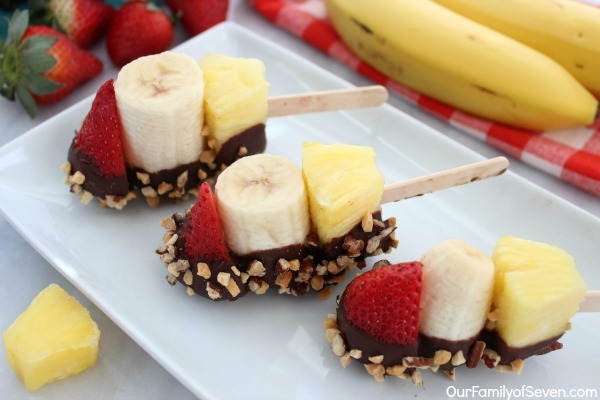 These Banana Split Bites place a fun and simple twist on your favorite summer treat. 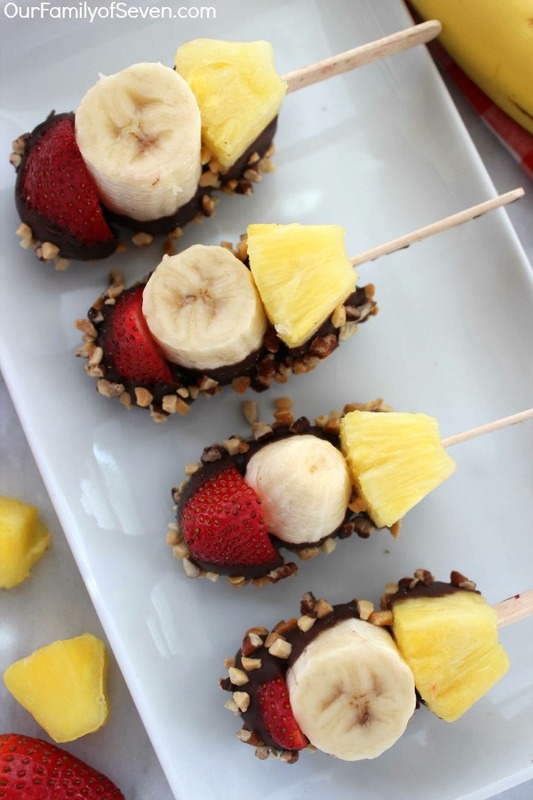 Just place Strawberries, Pineapple and Banana on a stick. Then add on some chocolate dipping and nuts! Bam! You have a fun summer time treat. We are always on the hunt for fun treats to serve up to the kiddos after a fun day in the pool during the summer months. It can quite often be extremely challenging to find a snack that is not filled with junk. 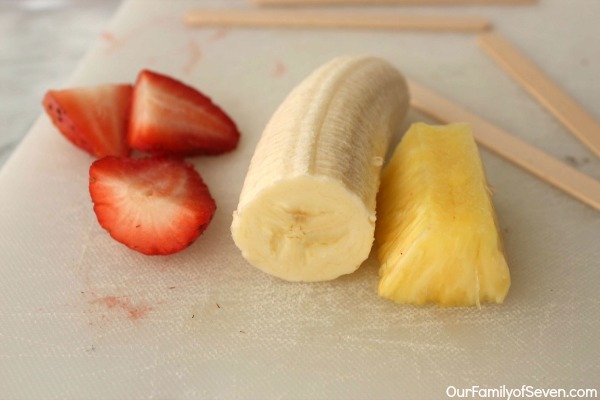 This simple treat idea sneaks in some fruits so it has me totally pleased. Banana splits are always so tasty. When I hit the ice cream stand, I am always anxious for someone to share a small banana split with me. 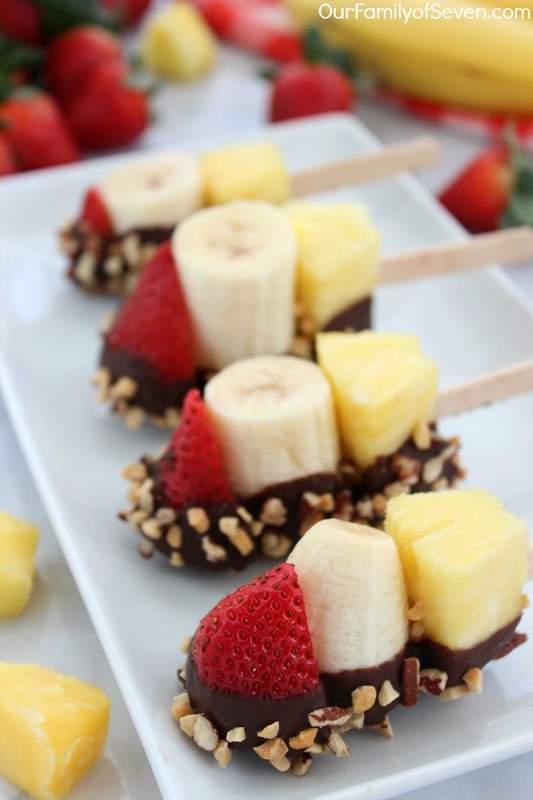 I love the combination of the pineapples, strawberries, chocolate and bananas. One small sized split can be a bit too much for me. 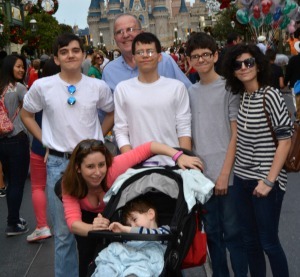 It is never to difficult convincing one of the kiddos to share with their momma, ha ha! 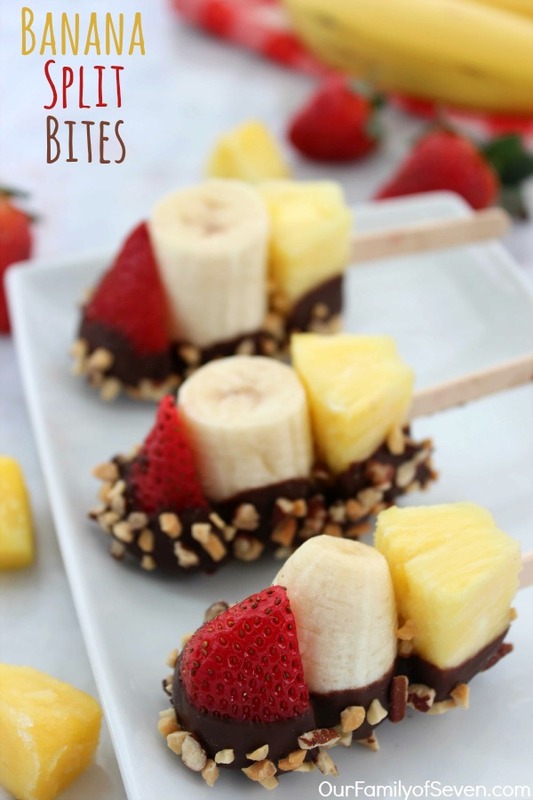 When the hubby whipped up these banana split bites while I was out doing some shopping last week, I was super excited to find my favorite summer treat on a stick. Everything tastes better on a stick, right? I seem to think so, lol. Since the fruit is chilled, this treat is both tasty and refreshing. Perfect for hot summer days. The kiddos were off at a friends house for most of the day so I was able to enjoy a couple of these treats before they raided them. I think the plate of bites was gone in about 5 minutes. These boys can really eat. WOW! 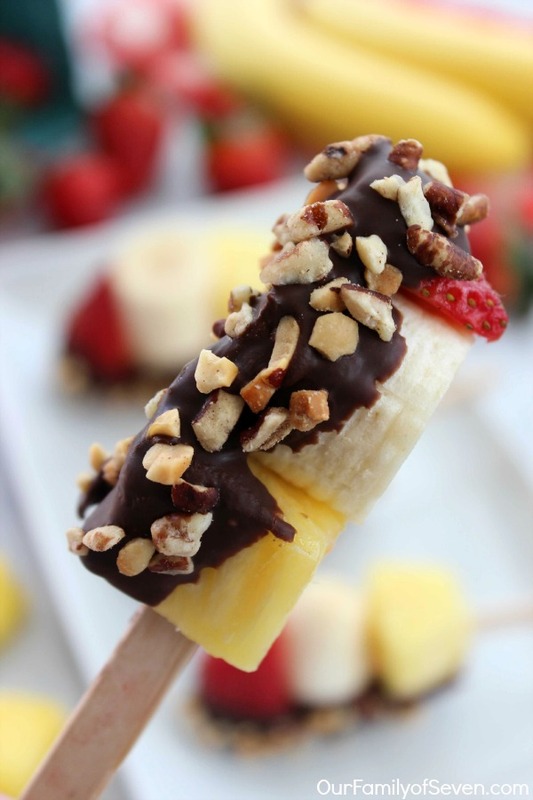 Making yourself these banana split bites is so super simple. 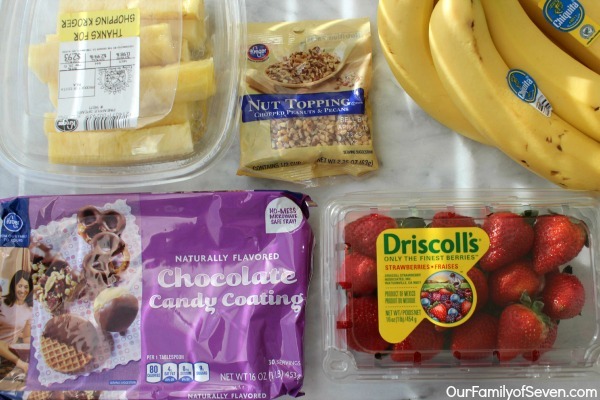 Just grab your usual banana split ingredients, minus the ice cream. 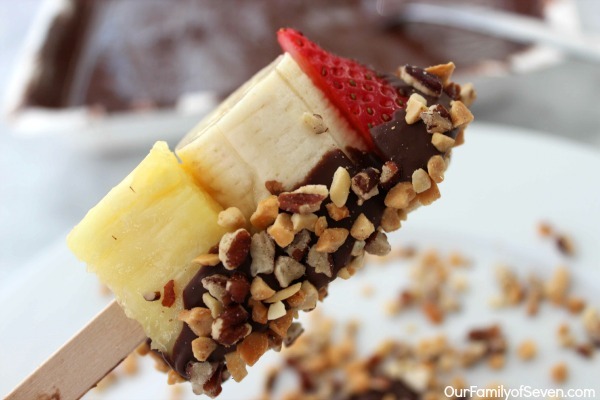 Place your chilled fruit on your Popsicle stick, dip in chocolate and then quickly sprinkle with nuts. I worked at an ice cream stand in high school and college. It was my all time favorite job. I am not sure if it would be such a perfect job for me now that I am older and count my calories, ha ha! Everyday I would make a small baby sized banana split or a baby sized hot fudge royal. Have you ever enjoyed a hot fudge royal? It’s made in a banana split boat with banana, vanilla ice cream, hot fudge, and nuts. The stuff is like heaven. Over the summer, I am thinking I need to make a hot fudge royal on a stick, I think it would be super yummy. This summer, we will be bbq’ing with friends and family quite a bit. I am anxious to make these for our first bbq this spring. I know everyone will enjoy them just as much as we did. They are perfect because you can make them ahead of time and keep them chilled before serving. Do you have a fun cold treat you like to serve at summer bbq’s? Put chooped nuts in small plate to use for dipping. 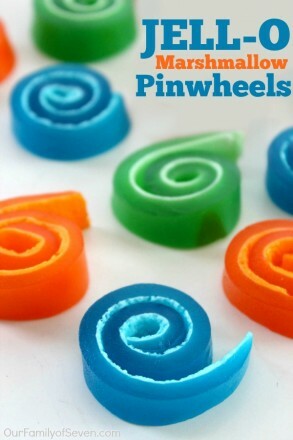 You can find this recipe linked up at the I Heart Naptime Link Party Palooza! I found you at the Foodie Friends link-up and I am SO glad I did. These look amazing! 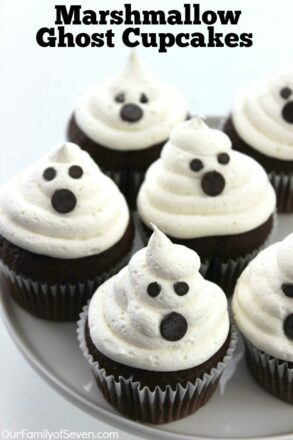 And what a fun idea… I think I am going to use these for my son’s birthday party this year. He’s not a fan of cake, so this might make a perfect alternative. Thank you for sharing! These are so fun! I can’t wait to make these for my family, they will love them! Bite sized food is awesome!!! Thank you for sharing! do you have a problem with the bananas going brown before serving? How do you keep the bananas from turning brown if you make these in advance? What a super cute idea! I love this – it’s perfect for summer. I can’t wait to make this with my daughter for our next backyard hangout.